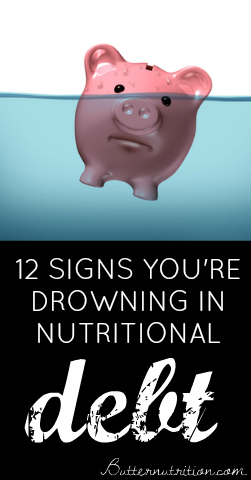 Home » Nutrition » 12 Signs You’re Drowning in Nutritional Debt (#1 is WAY too common)! By Catherine on March 2, 2013 | Last Updated April 14, 2019 | 2 Comments | Medical Disclaimer | This Post Contains Affiliate Links - I may receive a commission if you purchase through links in this post. How healthy is your bank account? And by bank account, of course I mean your nutritional bank account. Take a peek at the lists below. Which one describes you better? Sheila is a busy working mom of three young children (3 babies who her body created from “scratch” requiring lots of energy and nutrients) and she often puts her own self-care on the back burner because she is busy tending to the needs of her others. Hence she has been “borrowing” against her own nutritional bank account for years simply by not eating enough nutrient dense food. 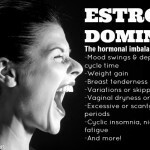 Her body has even ADAPTED to getting fewer nutrients by slowing her metabolism (less energy), decreasing her digestive juices (resulting in bloating and constipation), giving her wild food cravings (making her think about food all the time), and her body starts holding onto fat for added survival protection. She now has digestive issues, is overweight, has never-ending food cravings, and feels like she drags herself through the day because her energy levels are so low. What is wrong with Sheila’s approach? The marketing industry is a huge culprit for brainwashing you into thinking you need to “diet” and “cut calories” when in reality, both excess weight and food cravings represent a deficient body that is starving for nutrients! However, it is a clever strategy for achieving great profits. All of the sudden, the market opens up for a “diet” version of everything (a manufacturer’s dream)! But what about specific nutrients, eating strategies, important principles, a customizable PLAN to lay it all out for you, and the shortcuts to make it EASY? My eBook, Creating Wealth: The CURE for nutritional debt does just that! So you can start addressing your nutritional debt and start working your way out of digestive distress, low energy levels, poor sleep and all the confusion right away! At least now you know there IS a way to get yourself out of nutrition debt. Do you have nutritional debt? Please share in the comments! Photo Credit: Dicken Weatherby, ND & The Nutritional Therapy Association. Hi. I have been eating around 90% organic, and around 90% Paleo ( no grins, no dairy, and no legumes etc) for the last year and a half. I had been dieting strictly for years so i stopped and ate more… I ate mostly saturated fats, low sugar, high protein ( grass fed organinc beef kangaroo and fish) and lots of veges and some berries. I gained around 8kgs and now i cant move it. I was always quick to gain weight all my ligfe. and have always truggles with getting it off and keeping it off. I take gelatine, try to support my gut biota, excersise even though my energy isnt great. Im doing everything right, and i know a lot about nutrition as ive been passionate about nutrition for years. I tried to purchase your book just now but it would not accept my email address ( as above). I am sorry about the spelling mistakes on here but the font for this is pale pale gray and i can hardly see it. Hope you have a ocmment for me or can tell me how to buy your book. Alsol what is the price in AUS dollars? This article really helps a lot and now I know I need to pay more attention to my body. I have pretty much all the signs but I’m at a normal weight for my age. I also found out last year that I have an extremely low deficiency in vitamin d. I’m only 17 years old so I’ll definitely be eating better.